Water is a natural solvent, dissolving a little of everything it touches as it falls and flows on the surface of the earth. It picks up minerals found in nature, such as iron, manganese and sulphur, as well as other contaminants produced by the everyday activities of humanity. Uses potassium permanginate to clean the media bed. Must refill with this chemical every few months. 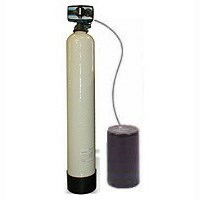 Raw water passes through a compressed pocket of air in the first tank, which precipitates the iron into solid form, and is removed when it passes through the filters birm media - no chemicals.